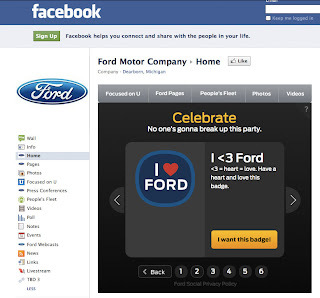 Ford recently launched a new social media badge program. A what? 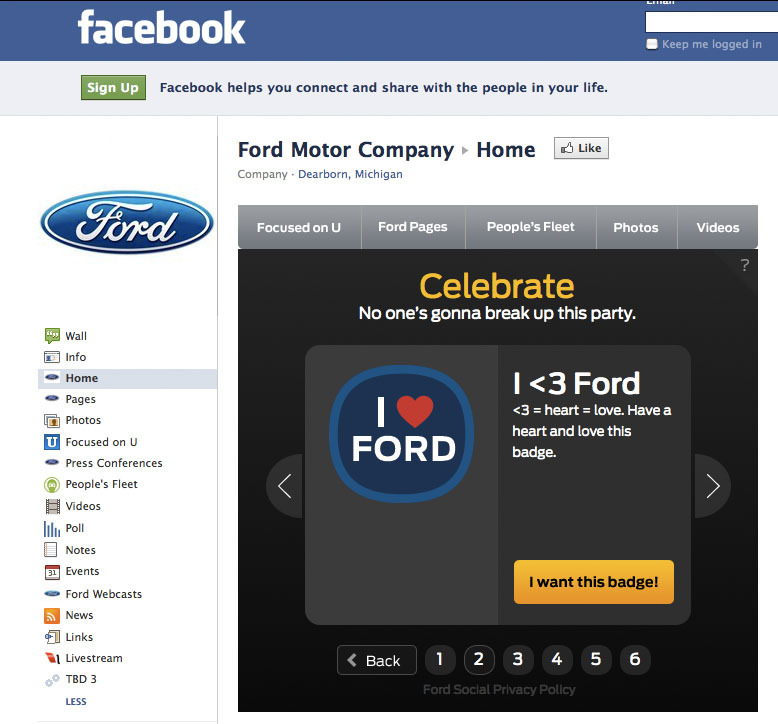 Technically they are called "Online Badges" according to Ford's Facebook page. 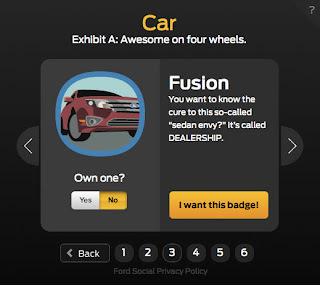 The badges are images that Ford fans can use to identify themselves with Ford products, history, personal connection, or affinity for the brand. People select badges where they can download the badge image which can be used as a Facebook profile image, this is pretty normal behavior from what I've seen the past few weeks, or one can share their badge by posting to a major social network like Facebook, Twitter, and even Google+. Scott Monty, Ford's Head of Social Media, recently shared on The Bean Cast marketing podcast that the current badge program is just the first phase of a larger effort. The larger effort becomes apparent after selecting a badge where users are asked to join Ford Social. Access provides the following according to the Facebook application: "you'll get exclusive insider goods: access to contests, games, vehicle reveals and way more." Ford Social isn’t just a new name and a new look. It’s an innovative program that will cross all kinds of platforms, online and offline. In short, we’re on a mission to celebrate the people who love Ford. I just want to know where is the "I Drove One" badge? Fortunately, Ford thought of that angle too. When clicking on a badge you can select whether you currently own one or not; though, clicking no doesn't really mean you were previous owner, but rather is an opportunity for them to sell you on becoming an owner. Take for instance clicking "no" on "Own one?" on the Fusion badge. It tells you, "You want to know the cure to this so-called 'sedan envy?' It’s called DEALERSHIP." Okay, not exactly the most compelling call to action ever, but certainly one way to say here's how to own one. I love this campaign and strategy. As my tweet said. Yes it's a smart way to extend relationships a company makes on social platforms and an interesting way to show brand pride your customers have about your products. superstore for: Motocross, go kart parts Dirt Bike parts，ATV parts, UTV parts.